"I like serving this dish as brunch when an all-day barbeque is planned. I usually serve it over rice with lemon wedges as a garnish." In a large bowl, mix together the Bloody Mary mix, hot pepper sauce, and lemon juice. Stir in the shrimp and halibut chunks. Let marinate for 10 to 15 minutes. Preheat a grill for high heat. Place a grill pan over the grilling surface, or you may use a heavy sheet of foil that has holes poked in it with a fork. Drain the shrimp and halibut in a colander, discarding the marinade. Grill for 10 to 15 minutes, stirring occasionally, until the seafood is browned and opaque. 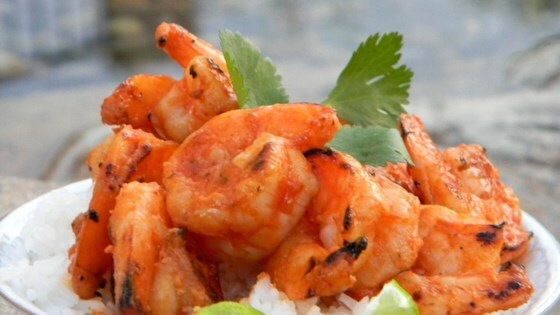 See how to make incredibly quick-and-easy, very flavorful grilled shrimp. This is very easy and cooks in just minutes. I would add some minced garlic or maybe use chili garlic paste instead of the hot pepper sauce next time. Overall this was pretty tasty.